The UFC hosted a pre-fight press conference Wednesday at New City Gas in Montreal in anticipation of Saturday’s pay-per-view extravaganza. 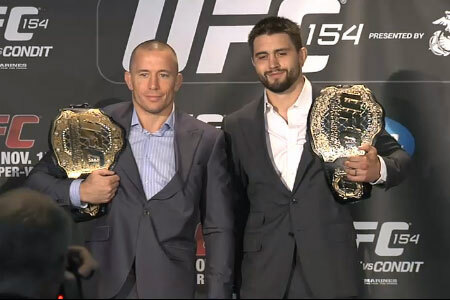 Welterweight champions Georges St-Pierre and Carlos Condit (both pictured) were in attendance, as well as media members from across the globe. The only thing missing from the steak was the sizzle. Each champ arrived dressed to the nines with their finely-pressed, name-brand suits prepared to conduct business. As expected, St-Pierre and Condit had nothing but good things to say about one another. GSP came with his standard vanilla “This is the toughest opponent of my career” schtick, while Condit only offered up sheer respect for the division’s G.O.A.T. Neither wanted to be recognized as the champion entering this weekend’s shootout, despite the fact they both could stake claim to the moniker because they each don the bling-bling. Although mixed martial arts is a combat sport, where brutally pummeling your foe in impressive fashion is the name of the game, respect for your opponent tends to reign supreme. However, while handshakes and smiles would be great if this were a course in etiquette, it hasn’t necessarily been good for the fight business this time around. Despite the fact GSP will be showcased in his homeland, set a North American live attendance record the last time he took center stage at UFC 129 and is ending his 19-month hiatus, tickets for UFC 154 are surprisingly still available. In addition, Xbox LIVE is offering a 30% discount off Saturday’s pay-per-view broadcast if fans purchase the event through their online community. GSP not selling out in his own backyard? His highly anticipated return being offered at a reduced rate? Out of sight, out of mind is the mantra that most MMA fans carry. It’s amazing how quickly some have forgotten how dominant St-Pierre was prior to December’s knee operation. It will be up to “Rush” to remind them on Saturday.